There are plenty of features I'm working on for the new Urban Terror, but not many are that interesting or visual. That, combined with the fact that writing blog posts takes quite a bit of time, is the reason why you see me so rarely post updates of the progress I'm doing on the game. Recently, I've implemented the crosshairs for Resurgence and that is something worth writing about. So, let's consider the situation in the game when shooting a bullet. 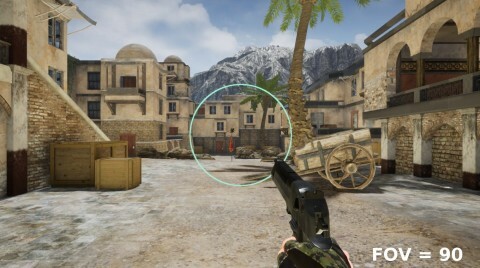 The player has a marker in the middle of the screen - the crosshair, which he/she can point in any direction to help direct the bullets from the gun into the target (preferably the enemy's head). Since we want the game to require a bit more skill than to simply click when your crosshair is on a target, there is a feature called spread. The faster you move and the more shots you fire in quick succession, the larger the spread value. 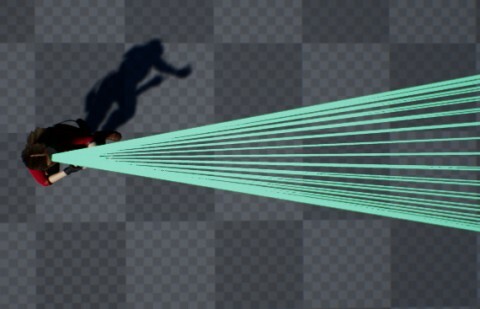 Instead of drawing a line from the player to where the center of the screen is, we calculate a cone and pick a random line inside that cone as the bullet's trajectory. The spread value is used as the angle of the cone. This is what a cone with 20° angle looks like. The idea is to control your movement and shooting patterns to control the randomness of your shots. Simply holding down your mouse button to fire as quickly as possible (called spray and praying) will increase the spread and the bullets will likely miss when the target is far away. Instead, you want to fire 2-3 bullets and wait a short time for the spread to decrease again before firing another couple of bullets. Crouching will decrease the spread making your shots more accurate, but at the same time making you a more or less stationary target. Interestingly enough, a cone from the player's view will end up being a circle with constant radius on the screen, no matter how long the cone is. That is because the view of the player is a frustum (a chopped off pyramid), starting at the same point. The radius of the circle on the screen is determined by the angle of the cone, the screen resolution and the field of view. With a bit of trigonometry involved to calculate the size of the crosshair on the screen, it is possible to have the crosshair exactly match the circle described by the spread cone. That means the crosshair can accurately show the player exactly in which area the shots are going to hit. This also ensures you can reliably compare the spread of the weapons by observing the crosshair. 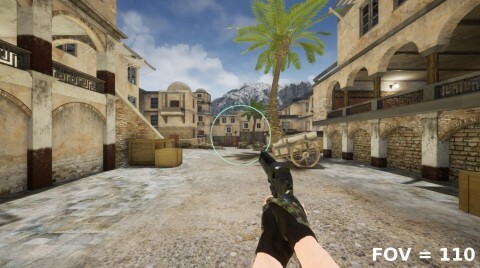 Many games use a single image file as crosshair, which gets scaled up or down. The problem with that approach is that the resolution of the texture determines how big you can scale it before it starts to look pixelated. Also, features like the width of a circle get wider with scale. More advanced crosshairs could use 5 images, one for the center and 4 for the sides, which get moved away from the center as the spread increases. That lessens the problems a bit, but you're limited in the shapes you can use. We chose a different approach. All our crosshairs are 100% procedurally generated, without any image files. I'll explain a bit how that works in Unreal Engine 4. The basic idea is to do math on the UV coordinates of the material to create geometric shapes. The U coordinates are a simple linear gradient from 0 to 1 in horizontal direction. The same is true for the V coordinates in vertical direction. Multiplying will scale the gradient, adding and subtracting will move the gradient. With other functions like clamping or taking the absolute, you can easily create a simple line. With more advanced math like using polar coordinates, it's possible to create all kinds of circular shapes. Combining a bunch of shapes can result in really interesting crosshairs. I've made extensive use of a library of complex functions I created about a year ago, which I'm also selling on the UE4 marketplace (shameless self-promotion detected). Check it out if you're interested in this sort of thing. The most awesome thing about this math-based approach is that all the values for scale, width, radius, length, color, opacity, number of lines, etc. can be adjusted in real time. Here's a preview of the 20 crosshairs I've created so far and how they scale with the spread value between 0 and 1. And here's a quick preview in-game. We haven't built a menu yet to select a crosshair or to adjust all the values. That's something I will do at some later point in time. Also note, there's a second feature called recoil, which moves your view a bit upwards when shooting, which I haven't mentioned here because it's unrelated to the crosshairs. Each weapon has 4 values related to spread, which we can adjust. The formula used to calculate the spread is different from Urban Terror 4, so we can't (and don't really want to) copy the values from the old game. We are going to change these parameters a lot during development, especially once we enter more extensive private and public testing. That's it. I hope you enjoyed reading this and maybe learned a thing or two in the process. I enjoyed working on this feature a lot and I'm really excited to have this in the game. I can't wait to try these in game. Thanks HappyDay! It's a good read. Thanks for sharing with us!! I'm anxious to try this. Now that crosshairs are procedurally generated, do you think it could be usefull/interesting to have an option so that color of crosshair is always the complementary of the pixels under it instead of a fixed color? 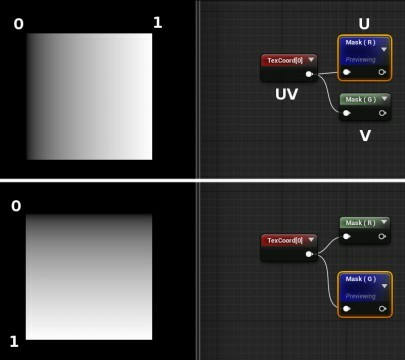 I think maybe there could be a filter box to do this in UE4. This is very important: "spread" should not mean that the bullet goes somewhere other than where the crosshair is pointing. Spread, should mean that the gun changes where it is pointed before the next bullet is fired, this means that the crosshair is also pointed in a new place. Please think about that logically - when you point your crosshair of your ["real world"] gun at something, and there is recoil (or whatever else) that causes your next shot to be off target that is because the gun (and thus, also the "crosshair") is shifted such that it is pointing somewhere other than where you had first pointed it. I'm not an Olympic pistol shooter, or ace sniper, but I have fired dozens of different real weapons from AR15s to .38 special pistols, and, unless you're aiming at something far away one thing is consistent and true with all of them: the bullet goes where the gun is pointed, not off to the side by a foot, or even more. You can hit a cigarette and cut it in half from across a room with a short barreled pistol every time, if your aim is good enough. So please, for the love of got please, don't do something that makes bullets go somewhere other than where the crosshair is pointing - if you must have spread, then make the crosshair MOVE to where the bullet will hit first. What you are describing is recoil, which is also part of the game. Spread and recoil are two different weapon features in video games. Spread describes the inaccuracy of the weapon, meaning shots hitting slightly off center, while recoil describes the camera movement that is forced on the player while shooting a weapon and thus moving the center of the screen off target. Both features can be 100% deterministic or include various degrees of randomness. This is the debate that pops up in pretty much every first-person shooter forum. How much randomness should there be? Ultimately this is a game design choice. Suppose there is no spread and no recoil; all shots always hit exactly in the center of the screen. Player skill is determined largely by how well you can follow a moving target with your mouse. If you are very fast and very accurate at aiming, other game mechanics like skilled movement or team play become less important. Now let's add recoil to the game. The view is now moved slightly when you shoot and to always hit your target exactly in the same spot you need to counteract that movement. Recoil can be random, which means you need to adjust your aim on the spot, in a fraction of a second to stay as closely on target as possible. Skill now also includes not only following a moving target on the screen but at the same time counteracting random offsets. Recoil can also be predetermined, like the spray patterns in CS:GO. Now a player's skill also includes his knowledge of the spray patterns and how well he has trained his muscle memory to counter them. Note, that at this point you can still hold down the fire button until your magazine is empty and all your shots will hit exactly the same spot, if you have trained enough. Let's add weapon spread. Bullets will hit off-center when your spread is higher. Spread could be an inherent weapon value. Like you said, weapons in reality are not 100% accurate - they are accurate within a certain distance. A gun in real-life might be accurate up to a range of 200 meters. If the majority of game levels only feature spaces which are much smaller, it is a design decision to define a far distance to be 30 meters. A spread value models exactly this. Skill now also is determined by moving closer to a target, when the spread becomes larger than the target, switching to a different weapon, or disengaging when you realize the enemy has an advantage based on weapon accuracy. Spread could also be determined by movement speed. The faster you move, the higher your spread. This is not that far from reality either. If you try sprinting while aiming down the sights of a weapon, you will find it very difficult to make your shots hit your target. Now, this could be modeled many different ways. The game could move the camera while running, move the crosshair (crosshair sway) or simply increase the inaccuracy by using spread. Again, it's a design decision. Skill now also includes slowing down when shooting or picking weapons with less movement spread, if running and jumping around is your play-style. Spread could also increase by firing multiple bullets in quick succession. Now it is not very desirable to just hold down the mouse button. Player skill now also includes the wise management of the firing pattern. Shorter bursts are more accurate than raining down endless amounts of bullets as quickly as possible. Spread could also be determined by patterns instead of randomly, which would make it one more thing to learn, practice and master to become even better at the game. Then again, you would encourage all the other game mechanics like movement or firing pattern management a lot less, once players also master the spread patterns. If a completely random spread turns out to be not so desirable for the type of game you're trying to make, you can always lessen the randomness by using different distributions, like conforming the randomness to a bell curve. If you wanted to be even more realistic you'd replace all hit-scan weapons with projectiles, which drop down over larger distances. You could also start modeling the influence of wind, humidity, etc. on the trajectory of a bullet. Once more, all of these are design decisions. Urban Terror is not designed to model reality as closely as possible. We are interested in creating a fun game, which at the same time can be quite competitive. We want the game to be enjoyable for players of all skill levels. Spread and recoil are just two tools that allow us to balance the game for a variety of play-styles and skill levels. Randomness in games is a welcome feature. Competitive games and random elements don't exclude each other. Some of the most competitive games involve lots of randomness, Poker for example. Generally, randomness in games introduces unexpected and exciting situations. Adjusting to those situations is often part of what makes the game interesting in the first place. Randomness also favors less skilled players. If there is little randomness a new player has little chance competing against a more experienced player. If there is some degree of randomness, skill differences become slightly less important and a new player might beat a stronger opponent every once in a while. Obviously, too much randomness lessens the skill ceiling and discourages people from working their way up to the top of the skill pyramid. Spread and recoil are two features which have been around for decades. Nothing is stopping us from making a weapon, which has 0 spread at all times. It's a balancing act to provide a variety of weapons for a variety of play styles. Having both features allows us to do just that. This blog post was meant as just a short explanation of the basic idea of spread and how the crosshair is connected to that. It is a player's way of seeing the inaccuracy introduced by that feature, so he/she can make decisions about how to deal with that aspect of the game. In addition, you got a sneak peek at future customizability of the crosshairs.